If you’re reading this then maybe you’re on your way to finally kicking the habit and becoming smoke-free and healthier. Now, it goes without saying that putting that last cigarette down is the single most important thing you can do for your health. For example, more than 25 diseases are associated with tobacco use, including cancer of the lungs, bladder, mouth, larynx, pharynx, esophagus, pancreas, kidney, uterus and cervix. What’s more, smoking raises your chances of developing emphysema and increases your risk of having a stroke by 30 percent. There is plenty of incentive to stop, and I know it’s not easy to do. 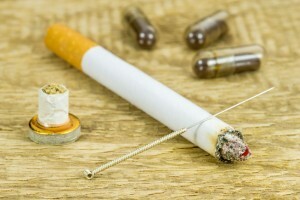 The good news for you is that acupuncture has helped millions of people to kick the smoking habit. Some of the largest stumbling blocks to becoming smoke-free are the stress, anxiety and depression associated with quitting. Using acupuncture to quit smoking yields enormous benefits. Aside from taking care of the stumbling blocks that can cause you to resume the habit, acupuncture can help restore your body to a healthy state of balance and well-being. If you are ready to become smoke-free, acupuncture can provide you with the support you need. Manage your cravings. They will actually fade within a few minutes, and when cravings do come find a healthy way to distract yourself. Before you know it they’ll be gone. It’s good to get some exercise, too. Take a walk outside and take deep breaths. Upon exhale, gently place your teeth together and exhaling with the sound of “sssssssss.” This sound stimulates the lungs.